I always had a weak spot for grand hotels. It must have been my mother who planted this seed in the early days of my life. We used to travel a lot together, to Europe’s old cities, Mediterranean getaways and snowy villages in the mountains. And wherever we went, we fell for the splendid charm, beautiful architecture and culinary excitement of a luxurious hotel – we’re girls after all. Be it for a few nights, or just a cappuccino or glass of wine at the bar, these places tend to take us into another world as soon as we walk through the revolving door. In Berlin, you can find one of these magical houses at a beautiful piazza framed by the imposing buildings of the Humboldt University and the Berlin State Opera, right on one of the city’s most prominent boulevards – Unter den Linden. 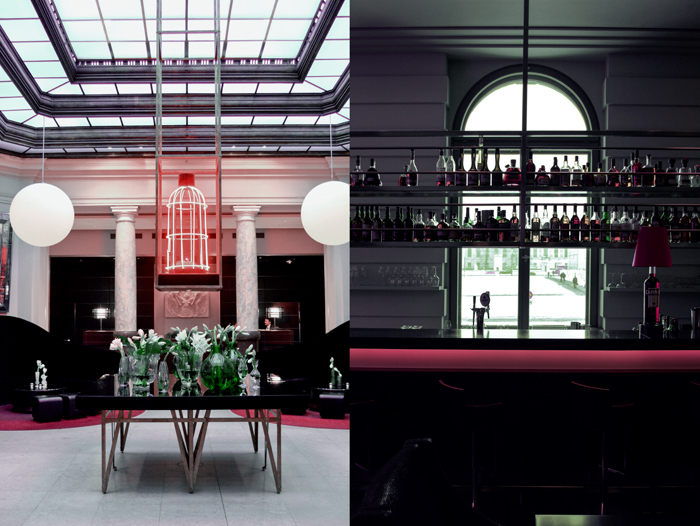 Walking into Rocco Forte’s Hotel de Rome reveals a house full of elegance and history. The former Dresdner Bank Headquarter was built in 1889, thick stone walls, marbled columns, gold leaf mosaics, and Berlin’s prettiest ballroom covered by a huge skylight, are symbols of an era of grandeur. The bank managers’ former offices have been turned into chic suites, and in the basement, where the hotel’s spa is located in our days, you can still see the rooms secured by heavy iron doors where the bank once held its gold deposits. Its a piece of the city’s history, preserved and turned into a place to relax, enjoy and savour. 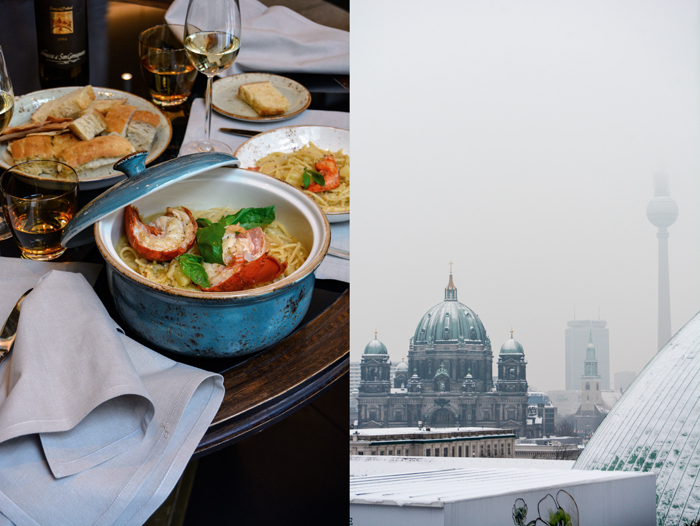 My personal highlight is the spacious roof terrace overlooking the city, it’s one of Berlin’s best locations to enjoy a sundowner on a warm summer’s night. I can’t wait for them to come back. 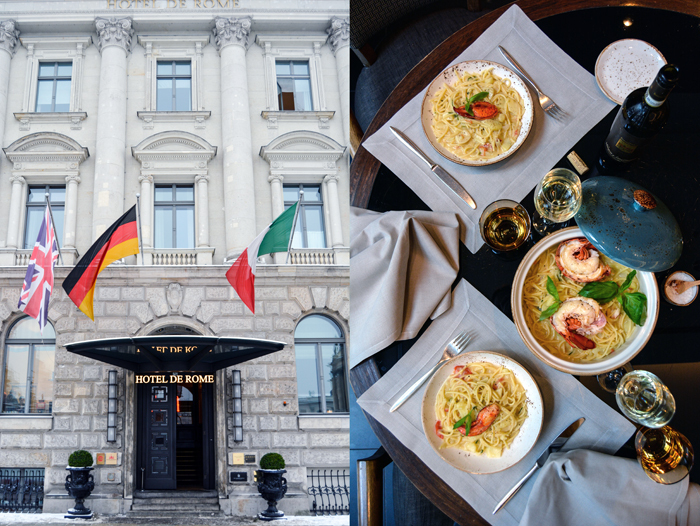 The Hotel de Rome combines two cultures – Germany and Italy – and especially in the kitchen, the Mediterranean side took over. The legendary Tuscan Michelin-stared chef Fulvio Pierangelini, Director of Food responsible for the honest approach to Italian cuisine in a few hotels of the Rocco Forte family, has a fantastic team here in Berlin. 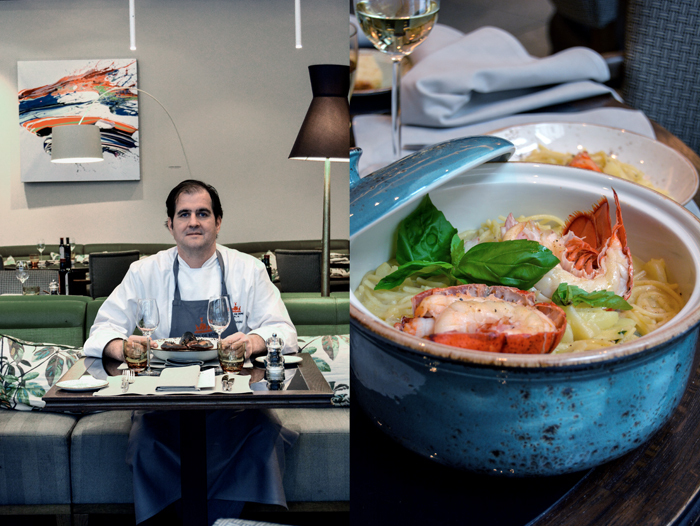 Jörg Behrend, Executive Chef, and his Sous-Chef Davide Mazzarella create such delicious treats at the La Banca Restaurant that I decided to meet them in their kitchen. On an icy-cold and snowy morning, I walked into the hotel’s bar in desperate need of a warming tea. After a chat with the Bar Supervisor, Jörg Wischner, I found out that the choice wouldn’t be easy. He offered me a selection of 40 delicate leaf compositions, which you can also enjoy at a traditional afternoon tea ceremony at the hotel’s cosy Opera Court, inspired by their London sister, the Brown’s Hotel. While I was sipping on a fragrant golden green tea, he explained the extensive cocktail menu, which made me wish I had come in the evening. But I was here to cook and learn about Capri’s cuisine. Davide’s family used to have a renowned restaurant on Italy’s little island in the Gulf of Naples, when Capri was still the place to be for Europe’s high society and American movie stars. He says those days are over, but the traditional recipes he learned to cook from his family, the time spent with them in the kitchen, peeling potatoes and chopping vegetables, made the young man want to become a chef and take his home’s scrumptious food out into the world. Jörg Behrend is from western Germany but he feels strongly inspired by Italy’s culinary treasures. Through traveling and working with his Italian-German team for many years, he has almost become Italian himself. So it didn’t take long for us to decide what we’d like to cook together: Pasta e Patata all Astice. 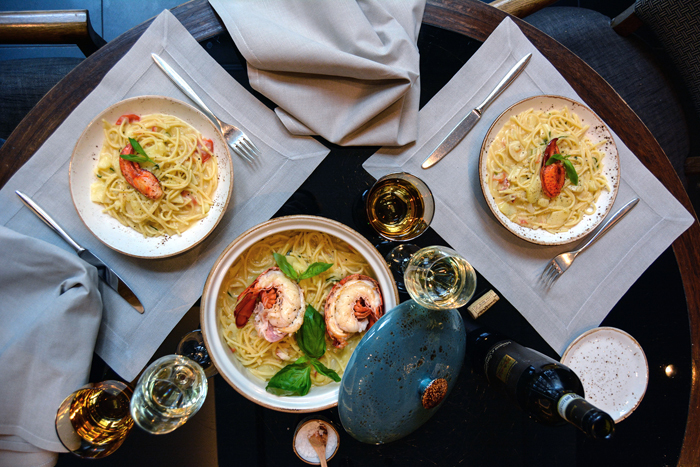 It’s a Capri classic that was completely new to me, thinly sliced potatoes and spaghetti cooked like a risotto and topped with a lobster. The everyday basic version is made without seafood, which isn’t necessary, but it turns it into an extravagant treat. Pasta e Patata is often served as one of many courses during a special family lunch. Needless to say, the meal was perfect, it’s one of the secrets of Italian cooking, you don’t need many ingredients to create something outstanding. I find it even better than risotto. To make our Italian lunch complete, we enjoyed it with crisp white wine at a big table together with the Hotel de Rome family. This is how it feels at this hotel, it’s a family taking care of you. Thank you Jörg, Davide, Türkan, Sebastian, and Jörg (at the bar) for a bit of Capri in Berlin! In a large, wide pot, heat a generous splash of olive oil over medium heat and sauté the garlic, onions, chili, and potatoes for a few minutes until the onions are golden and soft. Cook like a risotto, add a little vegetable broth to cover the potatoes, let the potatoes soak the liquid, and add a little more when it’s all soaked, stirring occasionally. Repeat until the texture is velvety thick and the potatoes are almost soft. Add the spaghetti and more broth and let the spaghetti cook, stirring, until al dente. Add more broth as necessary. In the last few minutes, let the dish thicken like a risotto. Stir in the tomatoes, Parmesan, basil (leave out a few leaves for the topping), and season to taste with salt and pepper. Cover and let sit for a few minutes. While the potatoes are cooking, prepare the lobster: In a medium, heavy pan, heat the butter and thyme over medium heat, add the cooked lobster, and cook until golden. 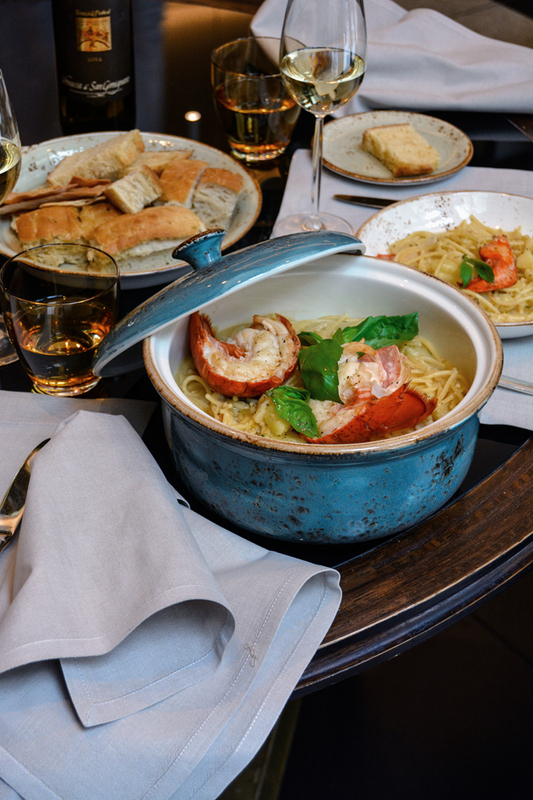 Divide the pasta e patata among plates, lay the lobster on top, and sprinkle with fresh basil leaves. Jörg, you are Chef de Cuisine at Rocco Forte’s Hotel de Rome and the La Banca Restaurant where the kitchen is run by a German-Italian team: Sous-Chef Davide Mazzarella is from Capri and Fulvio Pierangelini, Director of Food and founder of the famous – but now closed – Gambero Rosso in Tuscany, was born in Rome. Did this experience make you a little Italian? How important are different cultural backgrounds in the kitchen? Jörg Behrend: My Italian side grew considerably through working in our team. To understand the philosophy, the easiness, and the purism of the Italian cuisine, it’s important to have this constant exchange with my Italian colleagues. It helps to create delicious dishes. Davide, you worked in Michelin-starred restaurants in Italy, the L’Olivo in Capri and Davide Scabin’s Combal. Zero in Rivoli, before you decided to work abroad. 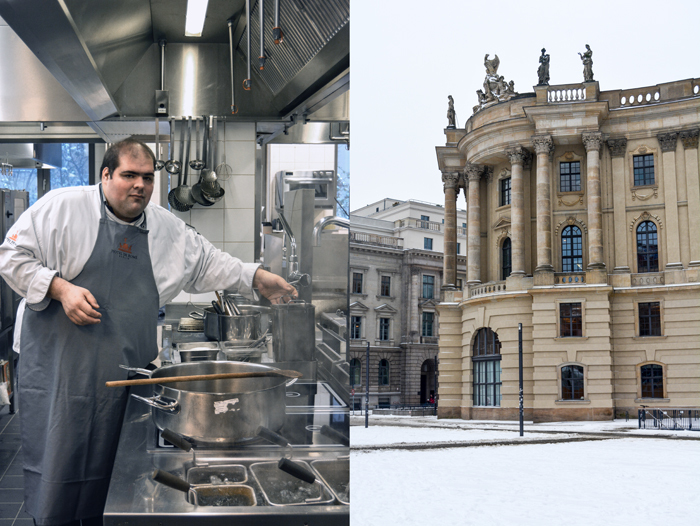 What are the differences between working as a chef in restaurants in Italy and in Germany? Davide Mazzarella: I don’t think that the differences between Italy and Germany are that big. It’s important to work professionally, in both places. There is a difference regarding the availability of ingredients and products, it’s much easier to get them in Italy. Always fresh and seasonal, it’s possible to buy whatever you need twice a day. In Germany you have to trust your suppliers and hope that they bring you what you need. Jörg, you are from Limburg, a picturesque town in the west of Germany. Does your home region’s cuisine come through in your work sometimes? Jörg Behrend: Unfortunately not, my home’s cooking is quite rich and rustic. There are also a few popular combinations that might be hard to understand if you’re not a local, like potato soup with plum cake. Davide, you grew up in Capri where your family ran a renowned restaurant for decades. How did this restaurant influence your life? How did Capri change over the years? Davide Mazzarella: I learned the kitchen basics in our family restaurant and I have to thank my grandmother and parents that I’m a chef today. They inspired me and they passed their passion for this job on to me. Capri is beautiful, and famous, but it had its glorious days between the 50’s and late 70’s. In the past 20 years, the island became too touristy and, with time, we lost many traditions. How important is the food and the cuisine that we grow up with as children for our adult life? 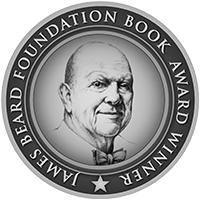 Jörg Behrend: The cooking of our childhood is essential and a guidance for the rest of our life. Looking back, I’m very thankful for my mother, giving us fresh, homegrown vegetables, freshly squeezed juices from the fruit from our own trees. The meat and cold cuts we ate came from butchers and farmers, where the animals were treated well. My grandmother was the queen of preserving. Be it sauerkraut or raspberry jam, all year round, she was busy preserving fruits and vegetables. It came with age, that I understood how – unknowingly – conscious my mother used to cook. This is a guideline for me and my wife, which we’re trying to hand down to our own kids, and to show them the recipes from our childhood. Davide Mazzarella: It’s everything. What we eat as a child and what we like is saved as a memory for the rest of our life. The smell is also important. The smell of tomato sauce still excites me as it did then, when I lived at home. 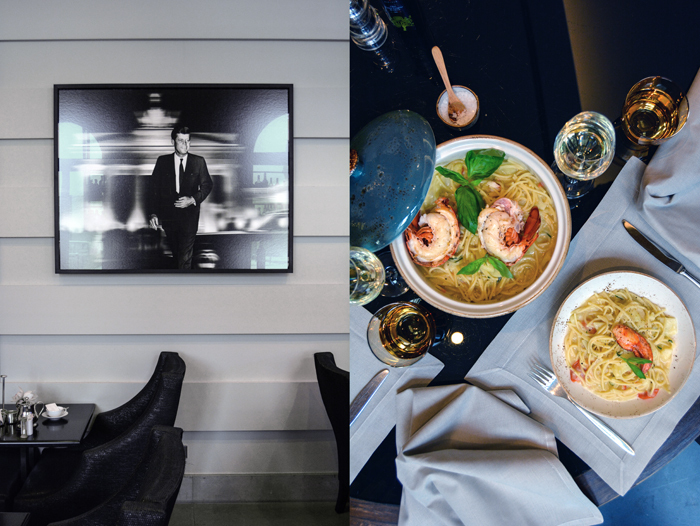 How did the German and the Italian cuisine change over the past 10-15 years? Jörg Behrend: The old recipes were forgotten. Then Nouvelle Cuisine took over, followed by a renaissance of the Deutsche Küche (German Cuisine) with the most modern techniques. Today, we cook regional, seasonal, and sustainable. We use the most simple products to create culinary highlights. We also use the entire animal again, rather than single parts. Back to the roots. 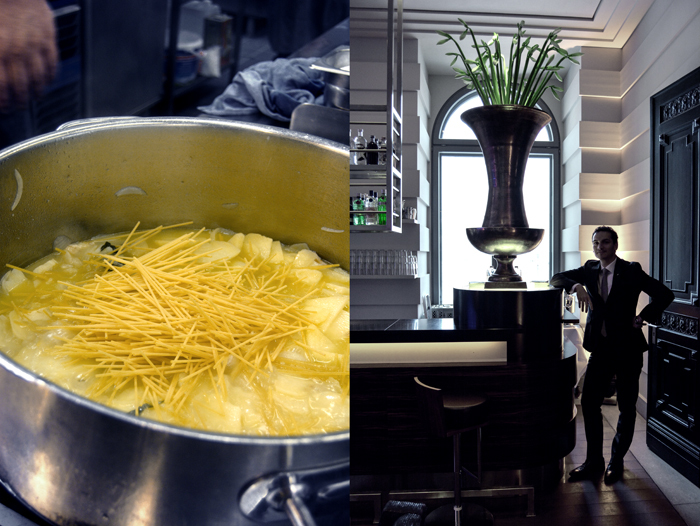 Davide Mazzarella: After the Nouvelle Cuisine, and the Spanish cuisine – with Ferran Adrià and the Molecular Cuisine – the Italian cuisine found it’s way back to its roots. Many recipes from the 18th century have been re-discovered and newly interpreted, with new cooking techniques and methods. 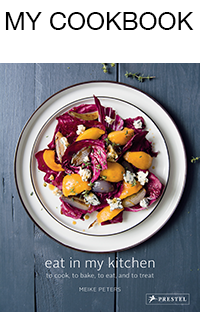 How important is seasonal and local produce for your creations? Jörg Behrend: The quality is important, if you can’t find the right quality in your region, you have to search for it outside the regional borders. We use seasonal produce for our creations. Davide Mazzarella: It’s very important. To work with seasonal and local produce is a MUST in our days. I love it, when our suppliers bring the produce from small producers from the countryside to our kitchen, it makes cooking more fun. How do you develop new recipes? Where do you find inspiration? Jörg Behrend: There’s a growing influence through social media, and through travels to Italy, looking for original recipes. Davide Mazzarella: Tradition, experience, personal technique, and knowledge. Inspiration comes naturally, and sometimes you have to take a peek at what others do. Who has been your biggest inspiration in the kitchen? Who or what inspired you to start a career in food? Jörg Behrend: Friends of my parents owned a hotel with a very good restaurant. I used to work there during my summer holidays and I was fascinated by the kitchen processes and the dishes they created. They offered me an apprenticeship and I gladly excepted. Davide Mazzarella: My family, but especially my grandmother and my mama. What was the first dish you cooked or baked on your own, what is your first cooking memory? Jörg Behrend: My earliest memory is the smell of fresh jus in the cooling room. I can never forget about it. Unfortunately, I don’t remember my first dish. Davide Mazzarella: I think it must have been spaghetti aglio e olio. It was disgusting. And I can never get the smell of O’ Rau (Neapolitan Sunday and holiday dish) out of my head. What are your favourite places to buy and enjoy food in Berlin? Jörg Behrend: Restaurant Grünfisch in the Gräfekiez, the farmers’ market at Karl-August Platz in Charlottenburg, Frischeparadies on Morsestrasse, Cafe Set´s on Schlüterstrasse, Küstlichkeiten in the Markthalle Neun. Davide Mazzarella: Vitaminchen at Oliver Platz, Frischeparadies on Morsestrasse, Masaniello Pizzeria on Hasenheide. If you could choose one person to cook a meal for you, who and what would it be? Jörg Behrend: Beef stew, together with my mother. Davide Mazzarella: Neapolitan Salsiccia wrapped in fig leaves and cooked in ashes, together with my father. You’re going to have ten friends over for a spontaneous dinner, what will be on the table? Jörg Behrend: Everything that I can find in the fridge, and everybody should bring something to the table. Davide Mazzarella: There will definitely be something on the table, I just don’t know what yet. What was your childhood’s culinary favourite and what is it now? Jörg Behrend: Spinach, potatoes and egg in my childhood. Salt-baked fish with artichokes and a salad of bitter lettuce leaves whenever I can get it. Or pasta sugo in all its variations. Davide Mazzarella: Riso e lenticchie (rice and lentils) in my childhood. Today: spaghetti aglio e olio my way. At home, do you prefer to cook on your own or together with others? Jörg Behrend: At home, I let my wife cook. When we have guests, everybody is involved. Davide Mazzarella: I don’t like cooking at home. And if I did cook, it would have to be for a beautiful woman. Which meals do you prefer when you cook privately, improvised or planned? Which meal would you never cook again? Jörg Behrend: Snails. I had to cook them during my apprenticeship. Davide Mazzarella: Once I got a sturgeon, alive. It’s an experience I don’t need ever again. Thank you Jörg and Davide!